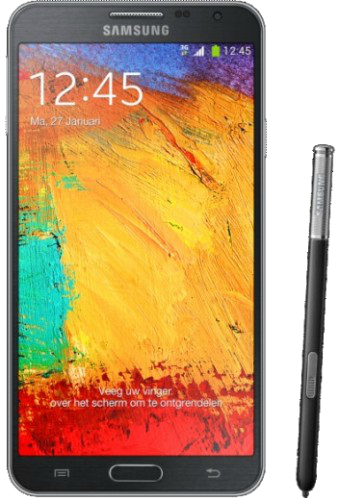 Samsung's GALAXY Note 3 SM-N900 specifications and features: this is a 5.7" (144.3mm) device with a FHD 1920 x 1080 screen resolution. The phone is powered by the Exynos 5 Octa 5420 soc with a Quad-core 1.9 GHz & Quad-Core 1.3 GHz configuration. Memory is 2GB, 3GB, with the device offering 32GB, 64GB internal storage and up to 64GB of external memory. The GALAXY Note 3 features Hall Sensor, Accelerometer, Geo-magnetic, Gyro-sensor and Light Sensor. The device measures 151.2 x 79.2 x 8.3mm and weighs 168g.